I used to have XP and I was able to use window movie maker to cut a piece out of a video. Now I have windows 7 and I am completely lost. I have lots of free programs but could always use more. I am trying to make a copy of a movie and then take a few clips out and really need baby baby steps. Well Ema, I don’t blame you in the least for being a little confused. Windows Live Movie Maker has fallen victim to Microsoft’s current penchant for adding ribbon style menus to their applications. To be honest, I much prefer the older style interface myself; it was straight forward and simple, nothing fancy but it wasn’t near as complex or confusing either. First thing you need to understand is that Windows Live Movie Maker will only accept video in certain formats, main ones are AVI, WMV, MPEG and MOV. You can view a full list of supported video formats HERE. So, if the video is any other format than those supported you will first need to convert it; the most versatile and commonly used format would be AVI. There are several free and easy to use video conversion programs available, I would recommend either Any Video Converter or WinX Video Converter. 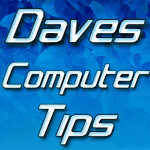 Dave's Computer Tips daves computer tips, video editing, Windows Live Movie Maker. permalink. The best feature of Movie Maker is the ability to match the slide show to the music. Each picture stays onscreen the right time needed to make pictures and music end at the same time. There’s a labeled button to use that feature. Also, the free editing programs listed didn’t include VirtualDub. It works best with avi’s, but there are free format converters. Easy to-the-frame editing.